Successful training organizations are focused on differentiating themselves and meeting the ever-evolving and complex needs of modern learners. They also know it is hard to make digital learning profitable – unless they have an easy way to make it personalized to learners, customized for clients and deliverable at scale. 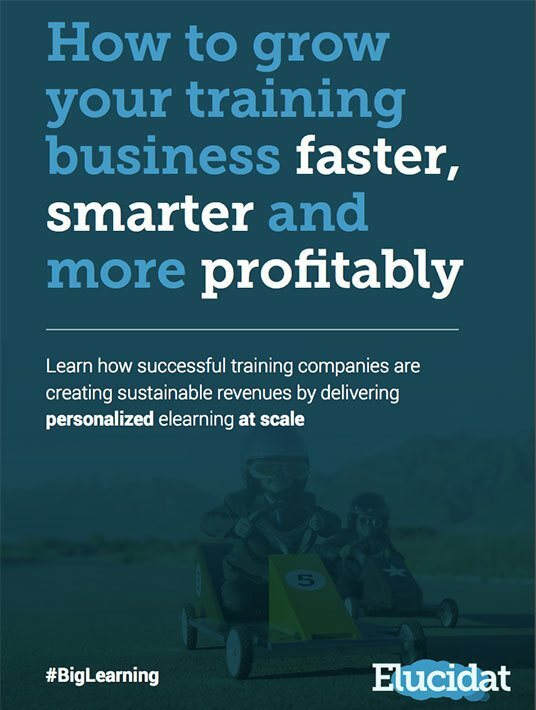 This ebook explores how winning training providers are growing faster and smarter by differentiating their products; increasing speed to market; improving ROI with more efficient and scalable production; and future proofing with the right learning technology. Opportunity is knocking, the time to go digital is now. Standard training methods are hitting their use-by dates; the most successful training providers are switched on and moving fast to deliver scalable, personalize elearning. Delivering the best learning experiences on the market is key to attracting and retaining your ideal customers. Deploy proven tactics to help your business put your training products in the top spot. Streamline your design approach and production processes to deliver personalized learning, efficiently at scale. Deploy the right resources and ensure your strategic framework is aligned to maximize business value, improve ROI and increase revenue. Ensure your technology is meeting the needs of the modern learner. Flexible distribution and access, content curation, social learning and reward mechanisms a key features of the next generation of learning technology. The right authoring tool is key to scaling the production of digital learning products, a must for ambitious training providers. Consider your ability to effortlessly manage assets and translations; repurpose and refine content; enable collaboration and review in the production process. What impact could being able to deliver personalized learning at scale have on your revenue. Analyze the ability to charge more, reach new markets and save as a result of efficiencies. The most successful online training providers are making smart choices when it comes to the learning products they’re focused on, the strategic framework they use, their production processes and the technology that enables them to deliver great products at scale. This eBook helps you become a successful training organization by providing you with great tips on how to get ahead of the competition with high-quality and fast deliverables that will keep both online learners and clients satisfied.